This is the loading face of B Reactor (1944), the world’s first full-scale nuclear reactor which produced the plutonium for the Trinity Test in Los Alamos, New Mexico and the Fat Man bomb dropped on Nagasaki, Japan. Here a hand-painted, wooden warning tag prevents workers from closing a cooling system valve at the loading face of the reactor. A broader view of the reactor operator's console and scram panel within the Control Room. This chair is an original. Today, a different chair is placed here during tour season. Years ago, I was on a tour here and Dee McCullough, the reactor operator who was on duty the first night of operation, was acting as a docent. This chair was in place but had a rope across the arms. I was talking with Dee as the group moved on. He leaned over conspiratorially and asked, "Do you want to sit in it?" I said, "Is that permitted?" He said, "Well... it's my chair so I think I can decide!" This is the reactor operator's console inside B Reactor. The clocks have been set to the time when B Reactor went critical on September 26th, 1944, marking the world's first self-sustaining chain reaction. This console in the Control Room is part of the monitoring instrumentation. This wiring harness for the temperature monitoring equipment for B Reactor's bioshield, is hand-tied wax string. Circuits are hand-soldered. A Ray-o-Vac D-Cell supplies a constant flow of electricity to the circuitry. This is part of the Control Room within B Reactor. These Venturi valve gauges monitor cooling water across the 2,004 process tubes containing fissile uranium fuel slugs. The south side of B Reactor is referred to as the far side because it is opposite from the Control Room. The most critical walls, those around the reactor core, are reinforced, cast-in-place concrete. Other walls were constructed of concrete brick and block, which could be completed faster. B Reactor (1944), the world's first full-scale nuclear reactor which made plutonium for the Trinity Test in Los Alamos, NM and the Fat Man Bomb dropped on Nagasaki, Japan sits at the 100B/C site in the northwest corner of the Hanford Reservation. Since the creation of the reservation, only 3% of the land has been disturbed with construction. The K-West and K-East Reactors are in the distance and the last free-flowing stretch of the Columbia River (i.e., water levels not influenced by dams). 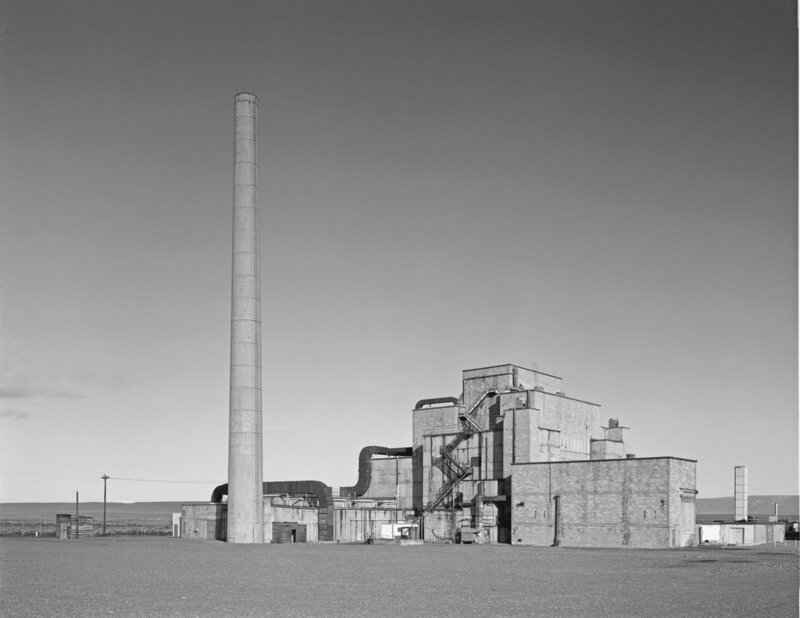 This photograph was published in Atomic Heritage Foundation’s 2018 edition of “Guide to the Manhattan Project in Washington State." Looking northwest toward B Reactor. A detail of the exhaust stack and ductwork of B Reactor. 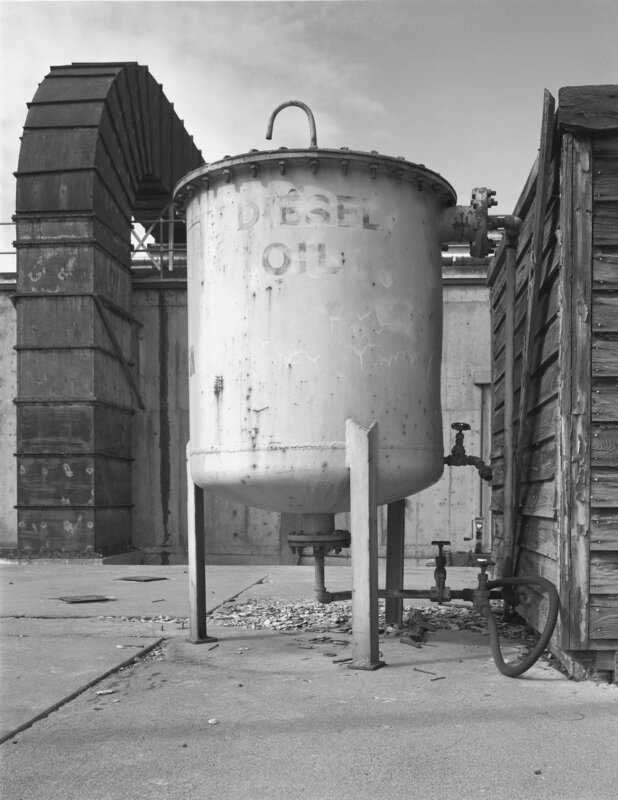 Diesel oil tank at B Reactor. An access door into the transfer and storage area on the far side of B Reactor and adjacent mechanical ductwork. Looking at the underside of the ballast tanks and the connection to the accumulators. 4x4 wood posts provide a "soft brake" if the ballast tanks were to crash down in an emergency. The system pumps are in the background. The vertical safety rods (VSR) are used to rapidly shut down the chain reaction in an emergency. The rods contain boron, a neutron absorbing material which "poisons" the chain reaction by robbing it of free neutrons. Each circular hopper contained a sixty foot long safety rod which, during operation, would be suspended by the cables up above the reactor core. In an emergency or a power outage they would drop by gravity into the reactor. The rods have articulated segments so that even if an earthquake shifted the graphite blocks of the core, they could still snake their way down. Piping on the far wall was part of a last ditch safety system, tanks (no longer extant) filled with liquid boron solution which could be poured down the VSR channels. Wet graphite would make the reactor useless so, a few years after B Reactor began operating, the liquid boron system was replaced with the "Ball-X" system, spheres of boron encased in nickel. These could also pour down the VSR channels but be vacuumed out later. At the left in front of the short stair is one of the vacuums--it looks like a rocket. The Bruggemann Warehouse on the Hanford Reservation. This was abandoned with the creation of the reservation. West and south façades shown. The Bruggemann Warehouse on the Hanford Reservation. This was abandoned with the creation of the reservation. This view is looking north inside the main storage space. Three pairs of carriage doors face east. The Bruggemann Warehouse on the Hanford Reservation. This was abandoned with the creation of the reservation. This view is looking at the east façade and its carriage doors from the window another room. 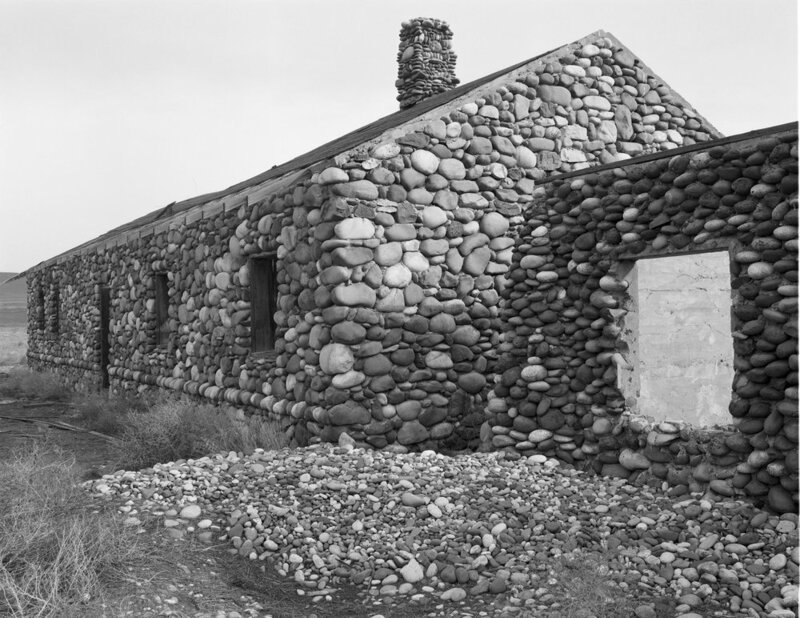 The Allard Pump House on what is now the Hanford Reservation supplied Columbia River water to the towns of Hanford and White Bluffs and irrigated thousands of acres of farmland. Fill has been added on the south side of the building. Originally, the building as surrounded by water and access was from the bank via bridge. The interior of the Allard Pump House looking west. This building was currently being used as the residence for a pair of barn owls. Hanford High School, abandoned with the creation of the Hanford Nuclear Reservation. 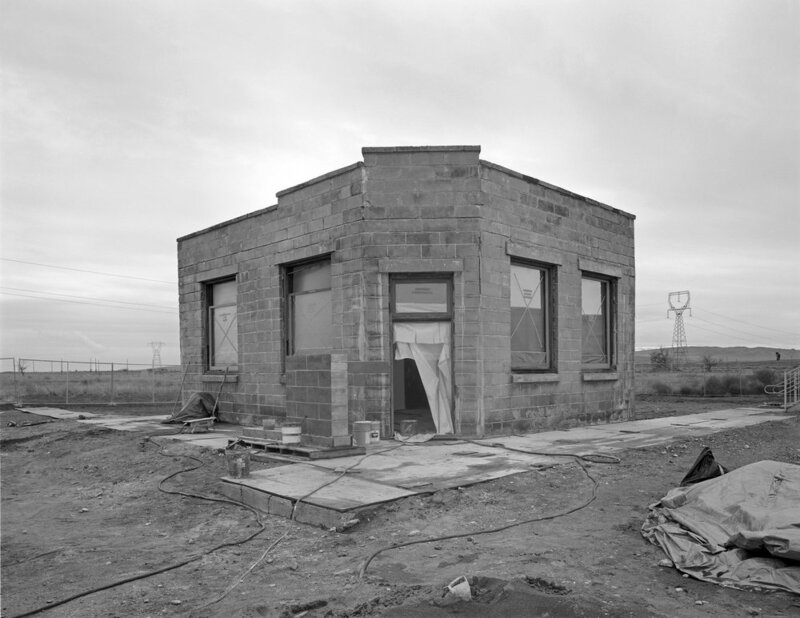 Little else exists of the town of Hanford, Washington. The White Bluffs Bank, currently under restoration. This is the only building remaining at the abandoned town of White Bluffs, evacuated for the creation of the Hanford Reservation. The block building still contains its safe. The existing wooden window frames and sashes, thanks to the desiccating climate, were mostly salvageable and were repaired and reglazed. 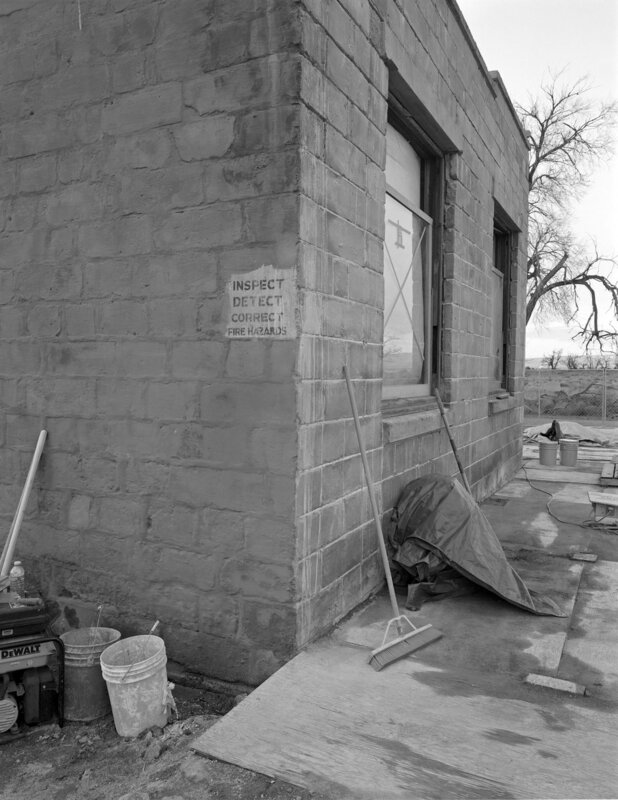 The White Bluffs Bank, currently under restoration, is the only building remaining at the abandoned town of White Bluffs, evacuated for the creation of the Hanford Reservation. Note the hand-painted sign, added after the bank was no longer in use, is being preserved in situ. It warns Hanford workers to "inspect, detect, and correct fire hazards," a serious problem at abandoned townsites.